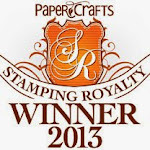 My Impressions: Simon Says Stamp Embellished Stepping Stone Card (& new Card Kit Winner)! Simon Says Stamp Embellished Stepping Stone Card (& new Card Kit Winner)! I'm back to share another card featuring a way to use the fun new Simon Says Stamp Stepping Stones Cling Stamp. I stamped Simon's Stepping Stones Stamp onto Neenah Desert Storm Cardstock with Simon's White Pigment Ink, using Ranger's Medium Brayer to get a good impression. Once dry, I diecut the panel with the rectangle die from Simon's Bundle of Stitches Dies and adhered it to a top folded card. I die cut Simon's Painted Thanks Die three times from Simon's Black Cardstock and layered the pieces on top of each other before adhering the sentiment to the card. Finally, I filled the circles with various embellishments. 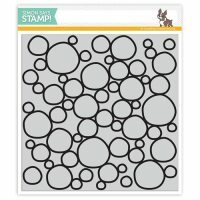 Before I go, I have a new winner for the Simon Says Stamp January 2016 Card Kit. Congrats Leni! 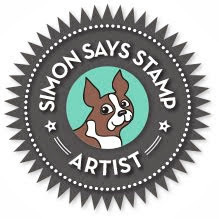 Please email me with your shipping info via the email button on my side bar so I can pass it on to Simon Says Stamp! I love this idea, Sarah! I have so many little embellishments laying around, this is perfect and makes such an impact! Like all the different embellishments! 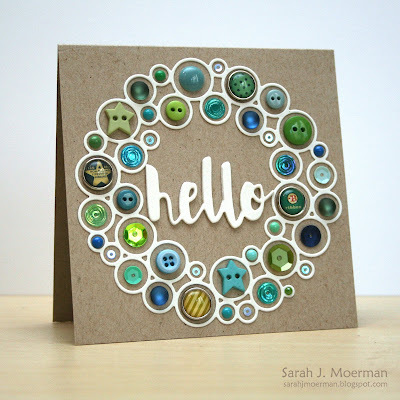 What a great card...love how you are using all these embellishments.